As played by veteran actor Bruce Dern in “Nebraska,” the new film from director Alexander Payne, 80-something Woody is a cantankerous pillar of stubbornness. His long-suffering wife Kate (June Squibb) is at the end of her rope. Dementia is creeping in on Woody’s mind, and he’s getting into the bad habit of wandering off and out of town, down the local interstate. Woody has a purpose, though: He’s just received one of those magazine sweepstakes coupons in the mail that says he’s won a million dollars. Woody can’t drive anymore, so he intends to walk – from Billings, Montana, to Lincoln, Nebraska – and claim his prize. Enter Woody’s son David, played by comic actor Will Forte in a successfully odd casting choice. David tries to explain that the sweepstakes bit is the oldest scam in the book, but Woody chooses not to hear that. The million-dollar prize is his last chance to be a winner. David sees his dad’s doomed quest as a chance to connect, and agrees to drive him to Lincoln, over the incredulous objections of mom and brother Ross (Bob Odenkirk). So begins the damnedest road trip movie you’ll ever see. 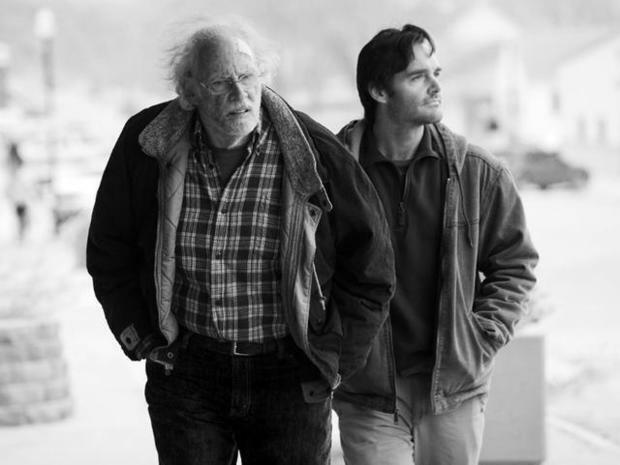 Shot in crisp black-and-white, “Nebraska” is both bleak and funny, its moments of grimness regularly offset by scenes of laugh-out-loud comedy. It’s a potent mix, with everything rooted deeply in character. Dern won the Best Actor award at the Cannes Film Festival for his performance, and it’s the role of a lifetime.